Home » EN 61800-5-2 » safe start » safe stop » variable speed drives » VSD » What are the safe stop methods in EN 61800-5-2? What are the safe stop methods in EN 61800-5-2? The EN 61800-5-2 standard defines methods for safe stop, safe motion and safe braking in variable-speed drive systems. 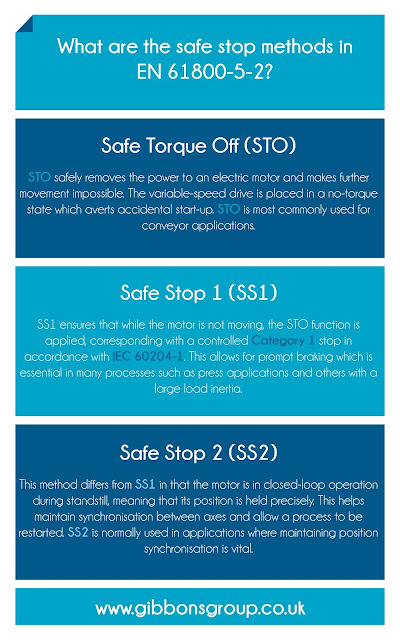 In this blog we’re going to take a brief look at the safe stop functions included in the standard. For more information on the safety functions of ABB drives, call Alan Roberts on 07966 468430 or email alan@gibbonsgroup.co.uk.